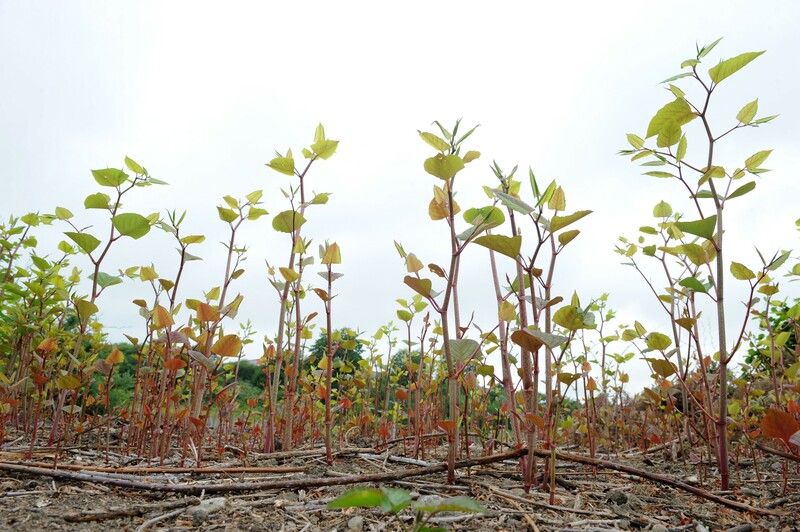 Homeowners blighted by destructive Japanese knotweed may be hoping that the plant has died when it fails to emerge from its winter hibernation as normal around mid to late-March. But in fact the recent cold weather, with more low temperatures forecast, is delaying the start of the plant’s growing season by 2 to 4 weeks, as it will not awaken until the ground temperature reaches around 4°C. The ‘Beast from the East’ brought the coldest February week in five years last month, with a new cold snap last weekend and lower-than normal temperatures forecast for the rest of March. This is causing Japanese knotweed, described by the Environment Agency as “indisputably the UK’s most aggressive, destructive and invasive plant”, to prolong its underground hibernation, before beginning its annual assault on property foundations, patios, driveways, cavity walls and drains. Homeowners should remain vigilant once the warmer weather arrives, looking out for signs of red or purple asparagus-like shoots which emerge from the ground and quickly turn into green bamboo-like stems. They grow at a rapid rate, up to 10cm per day, to reach up to 3 metres in height by June. The plant has flat, heart-shaped green leaves and blooms in late summer, when its stems become covered in tiny creamy-white flowers. Environmentalist Nic Seal, Founder and MD of Environet, said, “Normally we would see Japanese knotweed shoots springing up in warmer parts of the country and in sheltered urban areas during the middle of March, but the cold weather has set the start of the growing season back by at least a fortnight, possibly as much as a month. “Homeowners may be hopeful that their knotweed problem has disappeared, particularly if they attempted to treat it themselves, but it’s extremely unlikely that any DIY treatments will be successful and the plant is simply hibernating for longer than usual due to the unseasonably cold weather. While it isn’t illegal to have Japanese knotweed growing on your land, homeowners can be sued if they allow it to spread onto a neighbouring property. They must also declare the presence of knotweed on the TA6 conveyancing form when they sell their home, even if it has been successfully treated. Mortgage lenders will require an insurance-backed guarantee for the works before lending on the property. Environet offers a free Japanese knotweed identification service for worried homeowners, who can email photos to expert@environetuk.com.